The spa park was created as a horseshoe-shaped landscape park between 1851 and 1853 on the basis of plans by Peter Josef Lenné, the most important garden architect of his time. Although the park was extended at various times, the basic structure still remains today. Visitors encounter features in the park which bear witness to a glamorous and sophisticated spa world which was at its height during the first decades of the 20th century. From 1905 to 1908, the grandiose spa rooms were built at the south end of the park. These were designed to demonstrate Oeynhausen’s standing as a world-class spa.. Since then, a wide path leading from the spa rooms to the pump room with a large fountain in the middle has been the dominant feature of the central part of the park. In the same year, the Jordan spring was drilled in the south of the park. Its jet of water is over 50 metres high and is the symbol of the spa. In recent years, parts of the symmetrical axes have been renewed as originally conceived at the turn of the century and the character of the landscape park has been restored. The Landesgardenschau 2000 (regional garden exhibition) between the towns of Löhne and Bad Oeynhausen provided the occasion for the creation of a futuristic spa park with the motto “Aqua Magica – Magic Waterland”, a fascinating mixture of nature, technology, health and art. The most impressive building is a walk-in water crater from which a jet of water shoots up at irregular intervals. The varied history of the 26-hectare spa park at Bad Oeynhausen spans more than 150 years and has left its mark on the various areas of the park and a large number of historical and modern buildings. Visitors encounter evidence of a glamorous and sophisticated spa world which was at its height in the first decades of the 20th century. The park’s historical development is closely linked with the construction of the spa buildings. Its design underwent three main phases. The first began in 1847 with the design of a plan for the main park by Peter Joseph Lenné, the general director of the royal gardens in Prussia. Between 1850 and 1853, a horse-shoe shaped park was laid out based on his plans. The park, which is surrounded by a tree-lined avenue known as the Korso, formed the centre of the fast-growing spa from that time onwards. The characteristic basic structure of Lenné’s plan has remained largely unchanged to the present day. Another part of the legacy of this important 19th-century garden designer is the landscape-like area with old trees in the east of the park. Unfortunately, this area tends to be neglected by spa visitors. The design of the park was completed in 1896 with the creation of the south part by Fritz Gude, the garden architect from Düsseldorf. This landscape park was, however, largely cleared in the 1970s and 1980s, above all due to new buildings. 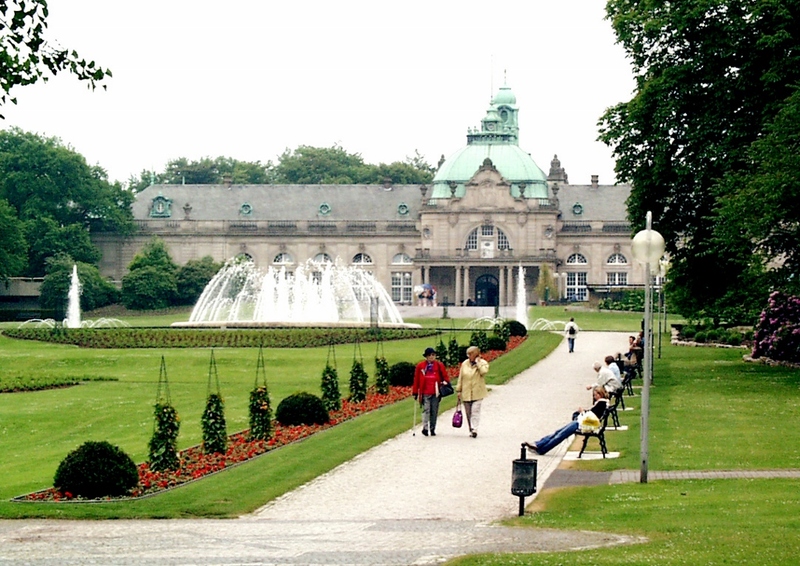 The grandiose spa rooms were constructed from 1905-1908 at the south end of the park and were designed to demonstrate Oeynhausen’s standing as a world-class spa. 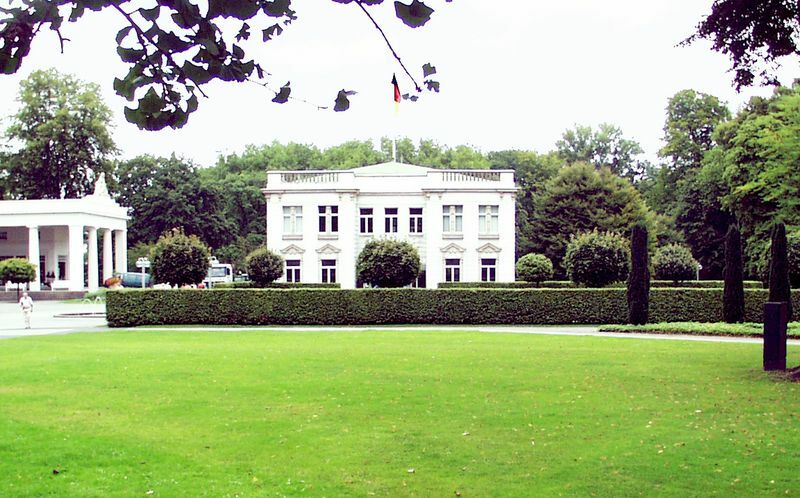 Garden architect Reinhold Hoemann was commissioned with the creation of a large parterre in front of the spa rooms in the second phase of the park’s history. Since that time, a wide path leading from the spa rooms to the pump room with a large fountain in the middle has been the dominant feature of the central part of the park. In the same year, the Jordan spring was drilled outside the original grounds, to the south of the park. Its jet of water is more than fifty metres high and has been the symbol of the spa ever since. After the Second World War, the British army used Bad Oeynhausen as its headquarters and fenced in the extended park area. The trees were also felled in some places . After the departure of the army, the most eminent garden architect of the Adenauer era, Professor Hermann Mattern, was commissioned in 1953 with the drafting of a general plan for the park. Mattern was repeatedly involved in drawing up plans for various parts the park until 1969. In particular, he changed the large parterre de pelouse and created instead an asymmetrical area of meadow. He also did away with the old geometrical paths and lines of sight. The inclusion of the Jordan spring into the south end of the park and the construction of a thermal baths for physiotherapy necessitated the removal of the south part of the Korso. In 1980, work began on redesigning the area between the pump room and the spa theatre using historical plans. The large path between the fountain and the pump room has also recently been restored. Although the path no longer continues to the spa rooms, it is the dominant line of sight in the park and a favourite motif for photographs. A framework for caring for the park is to be implemented by 2007. The Landesgardenschau 2000 (regional garden exhibition) in the towns of Löhne and Bad Oeynhausen provided the occasion for the creation of a futuristic spa park with the motto “Aqua Magica – Magic Waterland”. This park can be reached from the spa park via the Siekertal (Sieker valley). A fascinating mixture of nature, technology, health and art was created on the 30-hectare site by French garden architect Henri Bava. Two central elements dominate the park: the world climate avenue and the water crater. The avenue is designed to indicate subterranean geological faults, the existence of which is necessary for gaining access to the medicinal salt springs in the first place. Above ground, shady groves of trees alternate with sunny open spaces. The most impressive building is the 25-metre, walk-in water crater, where a jet of water shoots up at irregular intervals – a symbol of the elemental power of the salt springs. Further attractions include the spray garden and the Promenadenweg walk.